Look out for Nicola Joyce’s latest feature article in Weider Publishing’s Muscle and Fitness magazine, reporting on a series of strength and power training seminars. 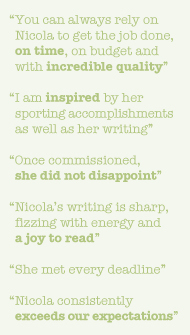 An online snippet can be found here Nicola Joyce is an experienced and well-connected freelance journalist who has been writing for sport and fitness publications since 2004. “Swimming Studies” by Leanne Shapton, which Nicola Joyce recently reviewed for the Washington Post’s “Book World” has won the autobiography category in the National Book Critics Circle awards. Nicola’s review of “Swimming Studies” is here.